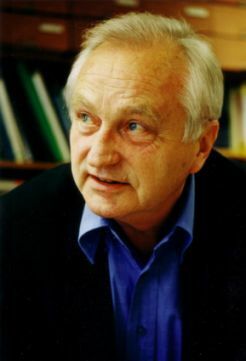 Prof. Dr. Dr. h.c. Bernhard Wilpert. Wilpert, B. (1961). Hilfe für Entwicklungsländer. Mannheim: Pesch-Haus Verlag, 1961. Wilpert, B. (1977). Führung in Deutschen Unternehmen. Berlin/New York: W. de Gruyter. Wilpert, B. & Rayley, J. (1983). Anspruch und Wirklichkeit der Mitbestimmung. Frankfurt/Main: Campus Verlag. Heller, F.A. & Wilpert, B. (1981). Competence and Power in Managerial Decision Making. New York: Wiley. Trevor, M., Wilpert, B. & Schendel, J. (1986). The Japanese Management Development System: Generalists and Specialists in Japanese Companies Abroad. London/Dover, N.H.: F. Pinter. Wilpert, B. (with Meaning of Working - MOW International Research Team) (1988). Meaning of Working - an international view. London: Academic Press. Wilpert, B. (with IDE - International Research Group) (1993). Industrial Democracy in Europe Revisited. Oxford: Oxford University Press. Büttner, T., Fahlbruch, B. & Wilpert, B. (2003). Sicherheitskultur - Konzepte und Analysemethoden. Krönig: Asanger. Negandhi, A.R. & Wilpert, B. (Eds.) (1978) Work Organization Research: American and European Perspectives. Kent, OH: Kent State University Press. Wilpert, B., Kudat, A. & Özkan, Y. (Eds.) (1978). Workers' Participation in an Internationalized Economy. Kent, OH: CARI-Publication. Endruweit, G.,Gaugler, E., Staehle, W.H. &. Wilpert, B. (Hrsg.) (1983), Handbuch der Arbeitsbeziehungen. Deutschland, Österreich, Schweiz, Berlin/New York: de Gruyter. Wilpert, B. & Sorge, A. (Eds.) (1984). International Perspectives of Organizational Democracy. International Yearbook of Organizational Democracy, Vol. 2. Chichester: Wiley. Trommsdorff, V. & Wilpert, B. (Eds.) (1991). Deutsch-Chinesische Joint Ventures. Wirtschaft-Recht-Kultur. Wiesbaden: Gabler. Wilpert, B. & Qvale, T. (Eds.) (1993). Reliability and Safety in Hazardous Work Systems. Hove: Lawrence Erlbaum. Hale, A., Wilpert, B. & Freitag, M. (Eds.). (1997. After the Event: From Accident to Organisational Learning. Oxford: Pergamon. Misumi, J., Wilpert, B., & Miller, R. (Eds.) (1999). Nuclear Safety: A Human Factors Perspective. London: Taylor & Francis. Wilpert, B. & Itoigawa, N. (Eds.) (2000). Safety Culture in Nuclear Power Operations. London: Taylor & Francis. Wilpert, B. & Fahlbruch, B. (Eds.) (2002). System Safety. Challenges and Pitfalls of Intervention. Oxford: Elsevier Science. Itoigawa, N., Fahlbruch, B. & Wilpert, B. (Eds.) (2005). Emerging Demands for the Safety of Nuclear Power Operations. Bacon Rouge, FL: CRC Press. Wilpert, B. (1979). Meshing Interdisciplinarity with Internationality. In R.T. Barth, R. Steck (Eds. ), Interdisciplinary Research Groups: Their Management and Organization (pp. 168-179). Vancouver, BC, Canada: International Group on Interdisciplinary Programs. Wilpert, B. (1987). Participation and Industrial Democracy: An International Review. In B. Bass & P.J.D. Drenth (Eds. ), Advances in organizational psychology (pp. 232-241). London: Sage. Wilpert, B. (1988). Meaning of Working in the Context of New Information Technologies. In V. de Keyser, T. Qvale, B. Wilpert & S.A. Ruiz Quintanilla (Eds. ), The Meaning of Work and Technological Options (pp. 29-36). Chichester: Wiley. Wilpert, B. (1989). Industrial Democracy - A Challenge to Leadership in European Work Organizations. In B.J. Fallon, H.P. Pfister & J. Brebner (Eds. ), Advances in Industrial Organizational Psychology (pp. 125-131). North Holland: Elsevier. Wilpert, B. (1990). How European is Work and Organizational Psychology? In P.J.D. Drenth, J.A. Sergeant & R.J. Takens (Eds. ), European Perspectives in Psychology (pp. 3-20). Chichester: Wiley. Drenth, P.J.D. & Wilpert, B. (1990). Industrial Democracy in Europe: Cross National Comparisons. In P.J.D. Drenth, J.A. Sergeant & R.J. Takens (Eds. ), European Perspectives in Psychology (pp. 115-131). Chichester: Wiley. Wilpert, B. (1996). Management as Risk Factor in High Hazard Systems. In P.J.D. Drenth, P.L. Koopman, & B. Wilpert (Eds. ), Organizational Decision-making under Different Economic and Political Conditions (pp. 71-78). Amsterdam: North-Holland. Fahlbruch, B. & Wilpert, B., (1999). System Safety - An Emerging Field for I/O Psychology. In C.L. Cooper & I.T. Robertson (Eds. ), International Review of I/O Psychology, Vol. 14 (pp. 54-93). Chichester: Wiley. Wilpert, B. (2004) Organisation und Umwelt. In Schuler, H., Brandstätter, H., Bungard, W., Greif, S., Ulich, E. & Wilpert, B. (Eds.) Lehrbuch der Organisationspsychologie. 3. Aufl. Bern: Huber. Wilpert, B. (1975), Research on Industrial Democracy: the German case. Industrial Relations Journal, 6 (1), 53-64. Dachler, H.P. & Wilpert, B. (1978). Conceptual Dimensions and Boundaries of Participation in Organizations: A Critical Evaluation. Administrative Science Quarterly, 1978 23 (1), 1-39. Drenth, P.J.D. & Wilpert, B. (1980). The Role of `Social Contracts` in Cross-Cultural Research. International Review of Applied Psychology, 29, 293-305. Wilpert, B. (with IDE - International Research Group) (1981). Industrial Democracy in Europe. Oxford: Oxford University Press. Wilpert, B. (1983). Zur Rolle der Arbeits- und Organisationspsychologie. Psychologie und Praxis, 27(2), 58-69. Bank, J. & Wilpert, B. (1983). What's so Special about Quality Circles? Journal of General Management, 9 (1), 21-37. Wilpert, B. (1984). Participation in Organizations: Evidence from International Comparative Research (also in French, Spanish, Chinese). International Social Science Journal, 36, 355-366. Wilpert, B. & Ruiz Quintanilla, S.A. (1984). The German Humanization of Work Programme: A Review of its First Twenty Publications. Journal of Occupational Psychology, 57, 185-195. Wilpert, B. & Scharpf, S.Y. (1990). Intercultural Management - Joint Ventures in the People's Republic of China. International Journal of Psychology, 25, 643-656. Quintanilla, S.A. Ruiz & Wilpert, B. (1991). Are Work Meanings Changing? European Work & Organizational Psychologist, 1, 91-110. Roe, R.A., Coetsier, P., Levy-Leboyer, C., Peiro, J.M. & Wilpert, B. (1994). The Teaching of Work and Organizational Psychology in Europe: Towards the Development of a Reference Model. European Work & Organizational Psychologist, 4, 355-365. Wilpert, B. (1995). Organizational Behavior. Annual Review of Psychology, 46, 59-90. Wilpert, B. (2000). Presidential Address: 24th International Congress of Applied Psychology, San Francisco, August 9-14, 1998. Applied Psychology: past and Future Societal and Scientific Challenges. Applied Psychology: An International Review, 49 (1), 3-22. Wilpert, B. (2002). Projecting a European Diploma in Psychology. European Psychologist, 7, 221-224. Wilpert, B. (2005). Stile der Aufsicht über die Kerntechnik und ihre Folgen. ATW-International journal for Nuclear Power, 50, 152-155. Wilpert, B. (2006). Safe, Secure and Ethical E-society. Annual reviews in Control, 30 (2): 255-259. Wilpert, B. (2007). Psychology and Design Processes. Safety Science, 45, 293-303.